A challenge… to every single restaurant in Midtown to come up with a new sandwich. A bold sandwich. A sandwich that pushes the boundaries of what human beings were meant to ingest. And you shall call it the “Midtown Lunch Special”. Add this special sandwich to your menu (temporarily or permanently) and we will post about it on Midtown Lunch. That’s it. You get free publicity, and more business… we get better sandwiches. Easy enough, right? What are the rules? Easy. Create a sandwich. Call it the “Midtown Lunch Special”. Add it to your menu. Charge under $10 for it (the less the better, obviously.) Email me at zach@midtownlunch.com to let me know. And then I will try the sandwich and post it on Midtown Lunch. You can offer the sandwich one day a week, or every day. For one month, or for 16 years. Whatever you want. Obviously, the better the sandwich is, the more interest it will generate. But that being said, EVERY sandwich will get posted about as long as the rules above are followed. What should this special sandwich be made up of? Well, if you need inspiration, you can look to the winner of the 2008 Readers’ poll choice for best sandwiches: Sophie’s Cuban & Tina’s Restaurant. Their fried pork and plantain sandwich is a stroke of genius, and exactly what we’re looking for. Bold. New. Unhealthy. Wrong (but oh so right.) The kind of sandwich that makes you say “You’re joking, right?” Burgers are ok as well… as long as there is bread of some kind, with stuff piled inside it. Burgers, hot dogs, whatever. Just make it good. Why am I doing this? Well, this is pretty obvious. In almost three years of doing this site I’ve never done any promotion, so I figured what better way to get the Midtown Lunch name out there by forcing Midtown Lunch spots to up their sandwich game for the Midtown Lunchers themselves! In other words, I’m a fat man, who likes to eat gross sandwiches. I’m bored with the sandwiches in Midtown, and what better way to fix that problem with a sandwich challenge. You know things are bad when readers are begging me to eat a processed sandwich from Walgreens. We can do better! For example, can’t we get a brisket sandwich with gravy and onion rings on top? This shouldn’t be hard. (Blarney Stone I’m looking at you.) Goodburger… bring back your fried egg and hash brown topped hamburger! (Why did you let it go away in the first place?) And what about a Rutgers style “grease truck” sandwich in Midtown? Is there no Italian restaurant willing to put chicken fingers, mozzarella sticks, and french fries on a roll and serve it smothered in cheese and sauce? Got any other ideas? Put them in the comments. We can do this people! Can any restaurant enter? Yes! And this is the beauty of the thing. There are a lot of sit down restaurants and standard Midtown delis that get ignored by Midtown Lunch’ers because they are either too expensive or uninspired. So- ignored restaurants… here is your chance! Want to get recognized by the Midtown Lunch Readers? 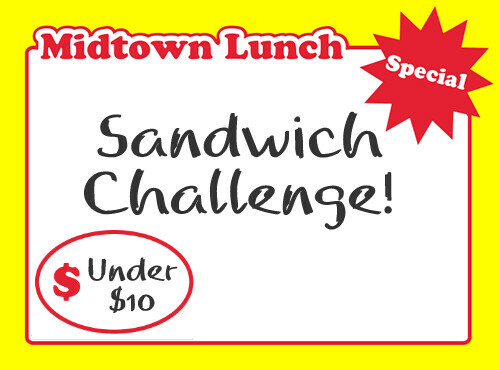 Make an awesome sandwich, call it the “Midtown Lunch Special” and charge less than $10 for it (ideally a lot less)… and you will get posted about on Midtown Lunch. I’m looking at you Cafe Metro, Pax, Europa, and Pret. Here’s your chance to offer something truly spectacular. Lunch spots that are already well known by the Midtown Lunch crowd? Reinvigorate your fans by adding a new and exciting sandwich to your menu. If you build it, we will come. So there it is. Free publicity for restaurants. Free publicity for Midtown Lunch. Awesome sandwiches for everybody!!! It’s win, win, win. So what are you waiting for. Restaurants of Midtown, you have your marching orders. Who will answer the challenge?!?! Posted by Zach Brooks at 11:30 am, January 28th, 2009 under Midtown Lunch Sandwich Challenge, Sandwiches. Jamaican Dutchy should start doing some sort of jerk chicken and coco bread sandwich. pastrami, cottage cheese on banana bread sandwich! I make that sandwich at home, except it’s not on a coco bread. It’s so good. This post is awesome. I hope you get some good contenders. I used to wander about there on sunday mornings looking for this sarnie nirvana…but never found it. *Must be served with very hot sweet tea. Hing Won could start making a sauteed udon w/ pork sandwich, not sure what they would use for the bread though. Instead of grilled cheese with tomato and bacon, I want a grilled lardo with tomato and bacon/pancetta/prosciutto (or all of the above). chicken, steak and lamb cheesesteak? If we’re going for Grease truck style food. Someone bring out the Falafel, French Fries, Mozzarella Sticks, Lettuce Tomato Sammie that they do. I was actually wondering if anyone has even ventured to Milant lately… and I had the brisket on rye yesterday at Blarney’s… That thing was dry as hell and had no taste. Needs tons of condiments and extras to make that sandwich tasty… That chicken finger and moss stick sandwich sounds amazing… perhaps on toasted garlic bread instead of a roll? For the veggies: Fried zuccini, onion rings and mozz sticks with spicy totato sauce on toasted garlic bread… seriously I can easily be a fat vegetarian LOL! #4. Roast beef, smoked gouda, horseradish, lettuce, tomato on on a twisted roll. Panera does a moderate version of it and its okay for chain food, but the above was much better. Problem is that I cannot for the life of me remember where I used to order it from. I wish I had a sandwich shop so that I can enter this challenge. @ Mamacita- That would be a veggie sandwich I would totally eat! Bulgogi sandwich with kimchi, cochu jiang (red sauce), over easy egg (make sure that yolk is runny, yo). No bread–just two patties of grilled rice, so that the outside is crispy, like the rice in dol sat bi bim bap, and it holds together. I’m gonna tell this to the bulgogi lady, and she’ll represent. For some reason I keep envisioning a dumpling sandwich. roast pork or crispy pork (the chicharron type), scallions, hoisin sauce on the fluffy, white taco-shaped bread used for peking duck. perhaps some sriracha if you’re feeling extra crazy. To riff on Chow’s idea – I want a hamburger but instead of buns I want two potato croquettes or mashed potato cakes. Skip the ketchup and add gravy. Make it like a shepard’s pie sandwich.